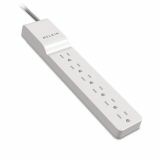 Surge protector that is UL and cUL Listed. Belkin Home/Office Surge Protector, 6 Outlets, 4 ft Cord, 720 Joules, White - Six-outlet surge protector offers surge protection for basic household electronics and home appliances. 720 Joule energy rating provides maximum protection of all your sensitive electronic devices. Six surge-protected outlets supply complete, three-line AC protection. Power cord delivers optimal, safe AC power through a 14-gauge heavy-duty cord. Surge protector filters EMI/RFI noise up to 43 dB reduction.